Eager to get into the Christmas spirit? We've got the perfect way to jump-start that festive feeling: a visit to the Great Smoky Mountains. Throughout December, the Gatlinburg-Pigeon Forge area offers countless fun events sure to banish the "Bah-Humbug Blues." At Dollywood in Pigeon Forge, Christmas glows with many colors... literally! Each evening at 8 p.m., on operating days, the theme park's fabled Showstreet hosts the Parade of Many Colors, an all-new extravaganza featuring eye-popping floats, interactive characters, and a heartwarming holiday message. If you and your family love a parade, you won't want to miss out on this one. 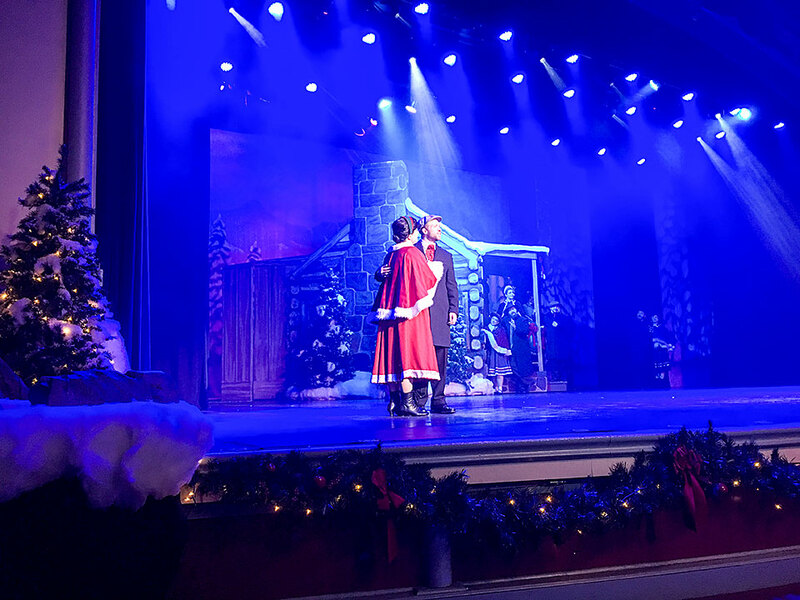 And, if you're classic-movie buffs, be sure to catch Dollywood's live presentation of "It's a Wonderful Life," based on the holiday film favorite. New this season, this uplifting show is performed daily on the hour at Showstreet, from 12 noon to 6 p.m. Be sure to watch for Zuzu's petals... and cheer when Clarence gets his wings! Up for some downhome fun? Y'all come to the Back Porch Theater for Appalachian Christmas, featuring foot-stompin' acoustic music daily on the half-hour, from 1:30 to 5:30 p.m. Love old-timey Southern Gospel? Head to the Pines Theater for Christmas with the Kingdom Heirs - a full 45 minutes of beloved holiday hymns. Live shows run every day at 11:15 a.m., 1 p.m., 2:15, and 3:15. You'll find lots more Dollywood dazzle this December, from Christmas in the Smokies to O' Holy Night. Not to mention the Timber Canyon Festival of Lights, Santa Land Country Fair, and more. Hungry for holiday goodies? Visit Gatlinburg's downtown area, famous for its quaint Old World atmosphere. Amid charming half-timbered buildings, you'll find plenty of popular bistros specializing in festive eats. 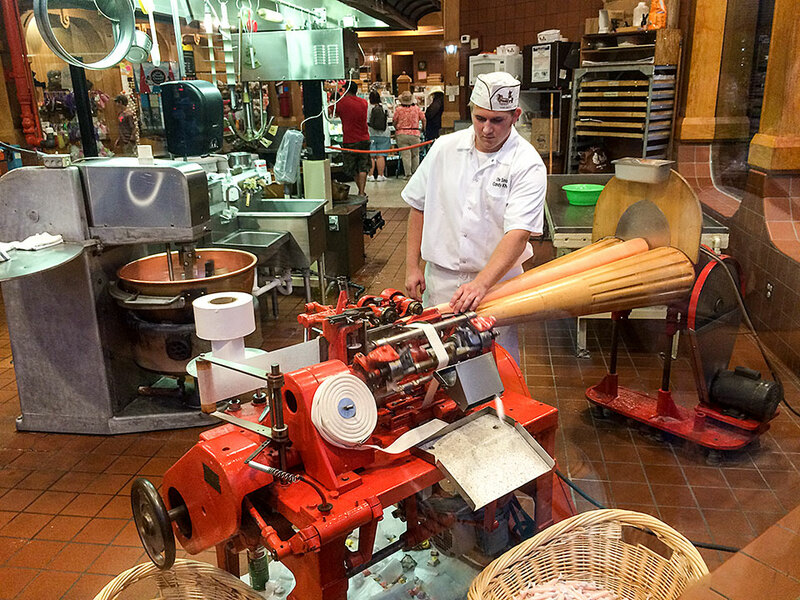 Check out the retro-themed Ole Smoky Candy Kitchen for mouthwatering homemade taffy. Plus, try the legendary Pancake Pantry for hearty comfort-food fare. Open daily from 7 a.m. to 3 p.m., this architecturally unique restaurant serves breakfast all day long and lunch after 11:30 a.m.
Up for some last-minute Christmas shopping? At the Village Shops, you'll find a wide array of one-of-a-kind gifts - from original art, candles & pottery to luscious gourmet treats. At night, take a leisurely drive or trolley ride to view Gatlinburg's spectacular Christmas lights. Then enjoy a delicious dinner at one of many fine local restaurants. Love outdoor sports? You're in luck. The Gatlinburg area is home to Ober Gatlinburg, one of the South's premier ski resorts. Here, from about mid-December onward, you can ski, slide, snowboard, and more amid breathtaking mountain scenery. Prefer hiking? December's the perfect time to take to still-open trails such as Laurel Falls and Schoolhouse Gap. Added bonus? With the leaves off the trees, those stunning mountain views extend for miles! What better way to end a fun-filled day than by relaxing before a crackling fire in a comfortable mountain cabin? At Volunteer Cabin Rentals, we offer a wide range of options, from rustic chalets to large luxury cabins, all with amenities galore. What's more, all our rentals are nestled right here in beautiful Wears Valley just minutes from Gatlinburg, Pigeon Forge, and Sevierville. Contact us today to reserve your holiday getaway!